May 3, 2018 — Watch out for the return of the sailing ship. Earlier this month, the International Maritime Organization (IMO), a U.N. agency in charge of shipping, agreed to cut total greenhouse gas emissions from shipping by at least 50 percent by 2050, and to pursue “efforts towards phasing them out entirely.” The race is now on to find technologies that can decarbonize the 50,000-plus tankers, freighters, container vessels and ferries that make up the world’s shipping fleet. Wind power is one of the options being discussed. International shipping counts for more than 2 percent of global carbon dioxide emissions, roughly the same as aircraft. But the 2015 Paris Agreement to fight climate change left control of the shipping industry’s emissions to the IMO. The new agreement is its response. Range of expected increase in carbon dioxide emissions from shipping under a business-as-usual scenario based on the Third IMO Greenhouse Gas Study, 2014. 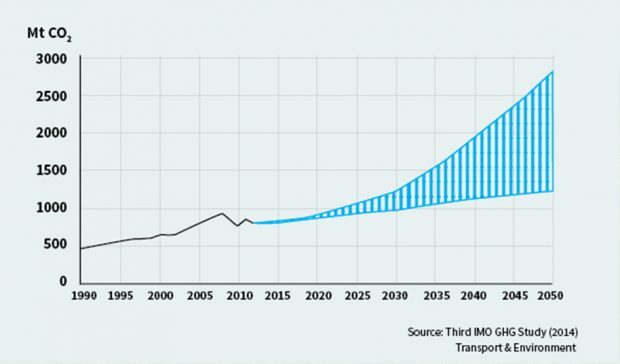 Graph courtesy of Transport & Environment. There is plenty more work to do at the London-based IMO, which promised a detailed strategy on how to implement the promise by 2023. While environment groups applauded the agreement, they pointed out that it falls far short of the 70 percent minimum cuts called for by the European Union and Pacific island states — and even further from what is technically achievable. The good news is that easy-to-do low-tech solutions can deliver a lot. For instance, after the 2008 financial crisis resulted in a drop in world trade and too many ships, Maersk, the world’s largest container-shipping line, discovered it could cut fuel use 30 percent simply by steaming more slowly. Because of the wide availability of cheap (and often dirty) fuel, shipping has traditionally been wasteful of fuel. Most merchant ships are made of heavy steel rather than lighter aluminum, and don’t bother with obvious energy-saving measures like low-friction hull coatings or recovering waste heat. Fitting ships’ bows with a bulbous extension below the water line reduces drag enough to cut emissions 2 to 7 percent. A technique known as air lubrication, which pumps compressed air below the hull to create a carpet of bubbles, also reduces drag and can cut emissions by a further 3 percent. Replacing one propeller with two rotating in opposite directions recovers slipstream energy and can make efficiency gains of 8 to15 percent. Even cleaning the hull and painting it with a low-friction coating can deliver gains of up to 5 percent. Such aerodynamic improvements that would be second nature to Olympic cyclists and tobogganists seeking the fastest times seem beyond the wit of the world’s shipping lines. But some of the biggest gains will require banishing conventional petroleum-based fuel, says the Sustainable Shipping Initiative, a progressive industry ginger group whose members include cruise lines and commodities shipping lines. 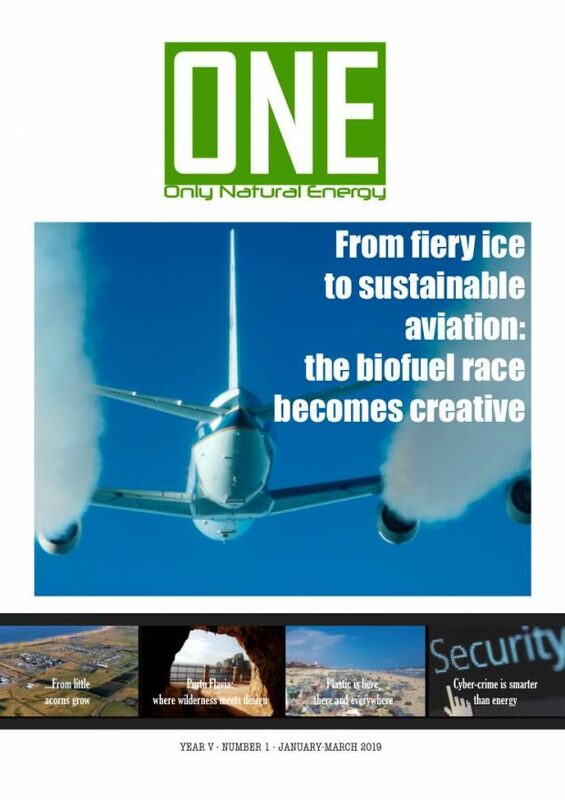 Innovations ranging from biofuels to liquefied natural gas (LNG), nuclear reactors to sails to catch the wind, and hydrogen to solar panels have been proposed. Each has its benefits and drawbacks, and nobody is putting all their money on one solution. Biofuels are problematic because they take land to grow, though specially engineered crops such as algae could change that, says the ITF. 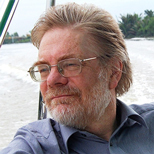 While electric engines already operate on some short ferry journeys, the sheer weight and space taken up by batteries on oceangoing ships make them unviable until there are breakthroughs in lithium-ion batteries. Solar power can only augment other power sources. One innovation already underway is converting ships to run on LNG. There are already more than a hundred LNG-fueled ships globally. A new generation of giant cruise ships powered this way and carrying up to 7,000 passengers will be launched by MSC Cruises starting in 2022. 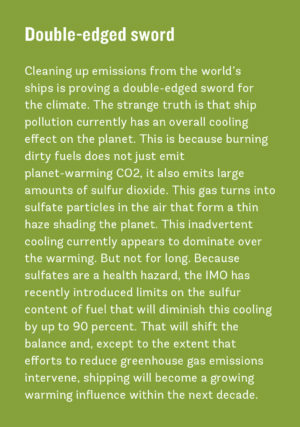 Some LNG ships claim a reduction in CO2 emissions of 15 percent, though that depends crucially on keeping leakage of the greenhouse gas methane to a minimum in ships and bunkers. 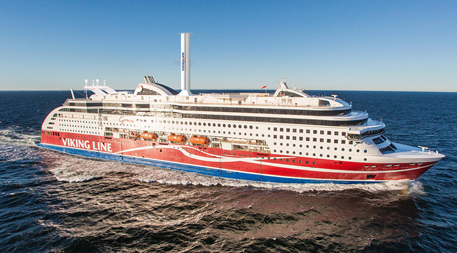 The first LNG-powered cruise ship is the Viking Grace, operating between Finland and Sweden. This vessel has another claim to fame. As of this April it also boasts the first ship-based “rotor sail” to capture power from the wind. Rotor sails have a large spinning cylinder amidships. Wind hitting the rotor creates a vertical force that can be used to power the ship, a phenomenon known as the Magnus effect. The Viking Line says the extra power will reduce the ship’s CO2 emissions by 900 metric tons (1,000 tons) per year. Putting together better designs and better fuel will create entirely new kinds of ships in future. And the blueprints are already being drawn up. 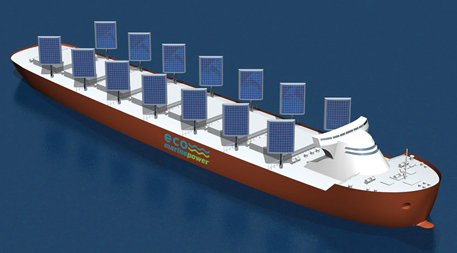 The Aquarius Ecoship is designed to use both wind and solar power to move cargo across the ocean. Photo courtesy of Eco Marine Power. The Aquarius Ecoship, a cargo ship devised by a Japanese company called Eco Marine Power, is driven by a phalanx of rigid sails and solar panels. The same system could power oil tankers, cruise ships and much else. It would not, the designers admit, entirely eliminate the need for conventional fuel: Even with large batteries to store the solar and wind energy, back-up would be needed. But it could cut emissions by 40 percent. Going one better, the Japanese shipping line NYK boasts that its design for a 350-meter- (1,100-foot-) long container ship, the Super Eco Ship 2030, would use LNG to make hydrogen to run fuel cells. Backed up by solar panels covering the entire ship and 4,000 square meters (40,000 square feet) of sails to catch the wind, the combination could cut emissions by 70 percent. Or for a completely zero-carbon option, engineers at Wallenius Wilhelmsen, a Scandinavian shipping line, offer the E/S Orcelle, a lightweight cargo ship designed to transport up to 10,000 cars (electric, we trust) on eight decks. It would be powered by electricity, half coming directly from wind, solar and wave energy, and the other half from converting some of that energy into hydrogen to power fuel cells. The company says the ship could be afloat by 2025. Today’s ships are in many respects almost indistinguishable from those of a century ago. But the IMO decision to finally get with the global climate agenda has fired the starting gun on what is set to be a race to create a new standard for low-carbon shipping that should be the norm just a few decades from now. Editor’s note: This feature is being co-published with The Guardian.